Somewhere in Chicago right now there is a wizard named Harry Dresden. You might know him because he is the only professional wizard listed in the phone book: “Lost items found. Paranormal Investigations. Consulting. Advice. Reasonable Rates. No Love Potions, Endless Purses, or Other Entertainment”. If you ever run into a werewolf, vampire, demon or other nasty creature of the night he is your man! Just don’t ask him to perform at your son’s birthday party because he is not a magician. That you would think that is just offensive. Jim Butcher knows Harry the best. There is rumor that Harry is merely a product of Butcher’s imagination, but I refuse to believe that bit of blasphemy. I also believe in fairies and nothing you say or do will ever erase the twinkle from my eye. 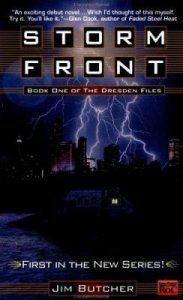 In any case, Jim Butcher has written a series of books called The Dresden Files detailing some of the more notable events from Harry’s life. 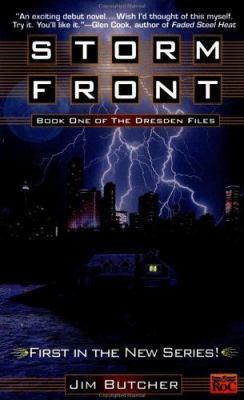 The first book in the series is Storm Front where we learn that “just because you are paranoid doesn’t mean there isn’t an invisible demon about to eat your face”. Sage advice. I must take moment here to point out that I have grown rather fond of my face and must thank Mr. Dresden for taking on said demon. My face thanks him. I also highly recommend listening to the audiobook version of The Dresden Files because James Marsters is magical. Just in case you didn’t know this bit of trivia, James Marsters played Spike in Buffy the Vampire Slayer. When I heard Mr. Marsters as Harry I am pretty sure I swooned and melted. In that order. I was a full on puddle by the middle of the first book. You may not be aware, but this review is in real danger of turning into a fangirl rave. But I am a professional so I will just say that Harry Dresden is a clever private investigator who likes to break tension with a perfectly timed one-liner that will have you tittering into your morning latte. If you like fantasy, P.I. stories, or have grown accustomed to your face, you will love Harry Dresden. Happy reading! Butcher, Jim. Storm Front. Penguin, 2000.